Howdy! 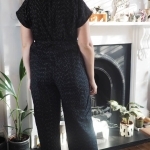 Now it may not look exactly like it, but this is my tester version of Tilly and the Buttons’ new pattern, the Marigold jumpsuit which was released on Monday. 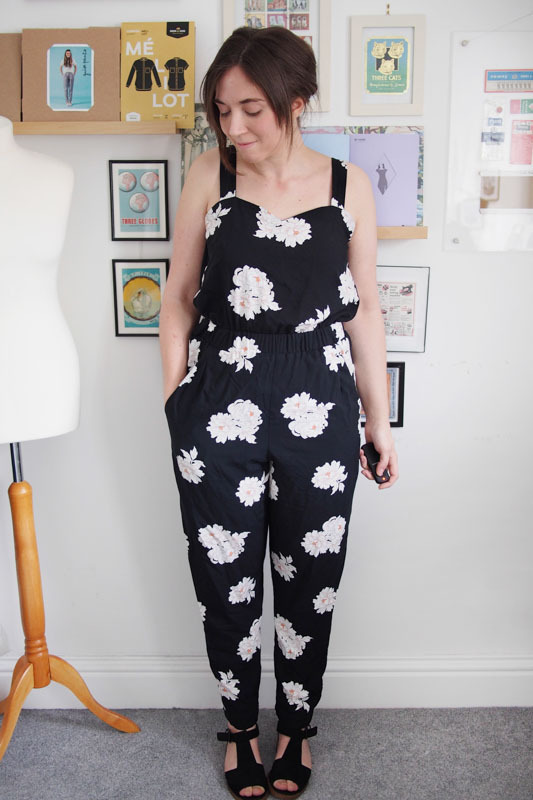 Y’all know I love a jumpsuit so I was happy to help test this pattern before the launch, and I’m pretty pleased with how my version turned out. 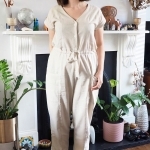 Marigold is a breezy elastic-waist jumpsuit with a loose pegged leg, dainty straps, and a sweetheart neckline, plus a variation to make standalone high-waisted trousers. 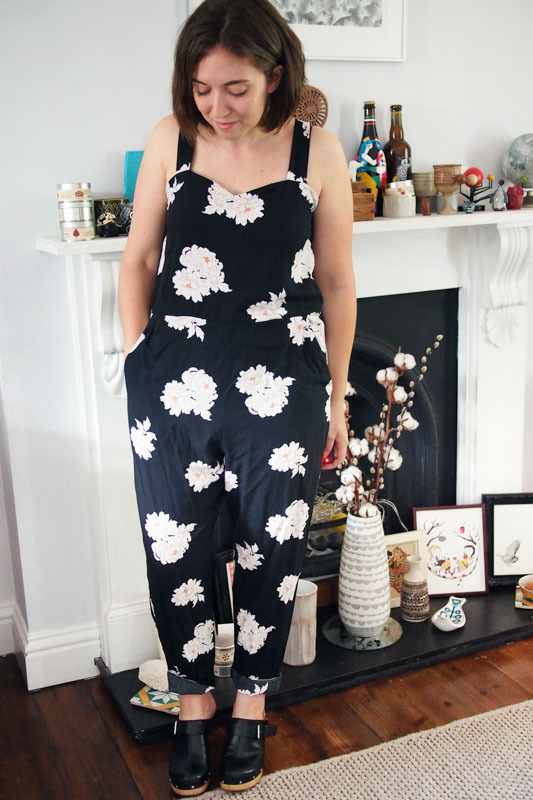 I think the jumpsuit’s very versatile too since you can wear it like dungarees with a tee underneath to adapt it to cooler weather. You’ll notice the key difference in mine around the waistline. After making the design as patterned for the testing process I made a small tweak for personal preference – removing the elasticated waistband and sewing the bodice directly to the trouser instead. I’m just all about waistless silhouettes right now – I think it looks more cool and modern, though it was perfectly nice with the elasticated band too. Here’s a ‘before’ shot. Did I make the right call? Sans t-shirt. I sewed a straight size 4 from the pre-release pattern and the only key fit adjustment I needed was to taper in the side seams at the very top to account for my hollow upper chest. I also reworked the straps as they were very short originally but that’s been corrected in the final pattern. Mine are skinnier than patterned because I had to re-cut from my very last scraps of fabric, also hence the annoying bra straps on show. 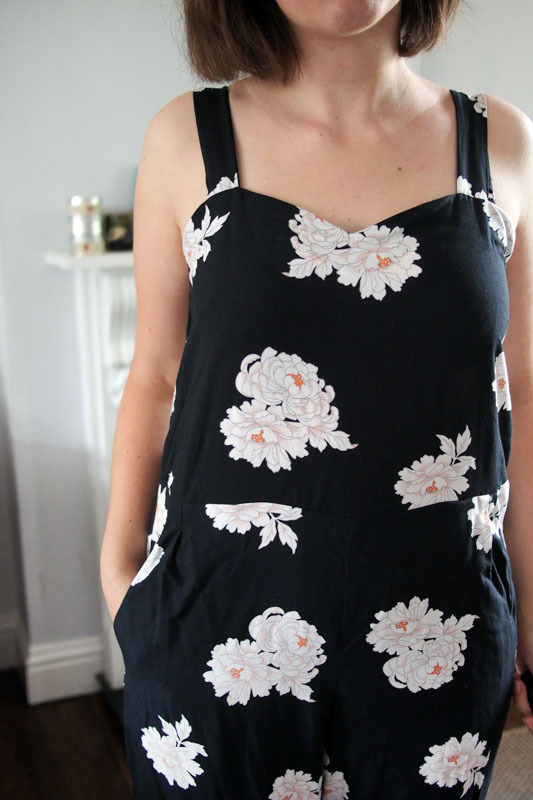 I used an extremely lovely large scale floral viscose which was an eBay steal. I’m not typically a florals type of person, but the scale and colours of this one really appealed to me. If it wasn’t sold out I’d buy more to make a floaty kimono jacket! It was a rally nice match for Marigold; you’ll want to use something lightweight and drapey but opaque. The pattern is marked for confident beginners but there are quite a lot of steps to tackle and bits of the fit to get right. It’s got pleats, darts, facings and an invisible zip to deal with so it’s a moderately involved project. But Tilly’s instructions are great and clearly photographed as usual so you’re in safe hands. I’m really happy with fit so I might use the pattern again with a couple of tweaks next time I get the all-in-one urge. Which probably won’t be long. 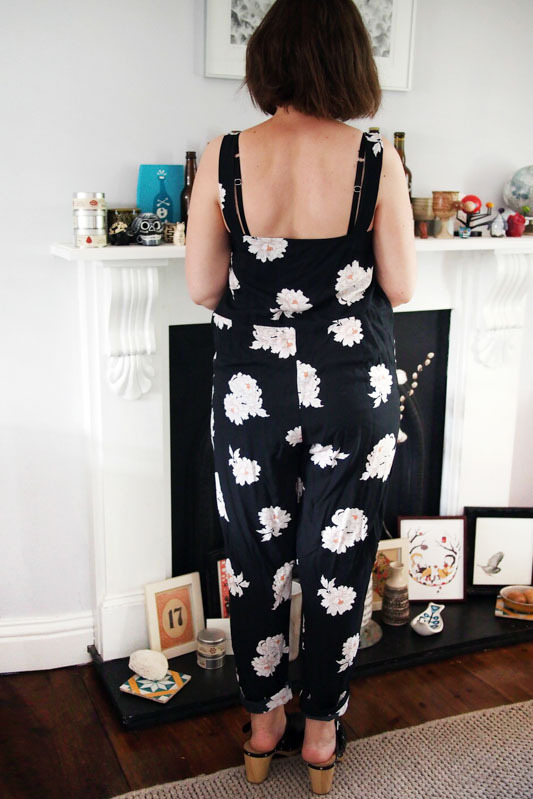 Long live the jumpsuit! I was a tester for this pattern, so I received it for free, and the photos/review don’t necessarily reflect the final pattern. 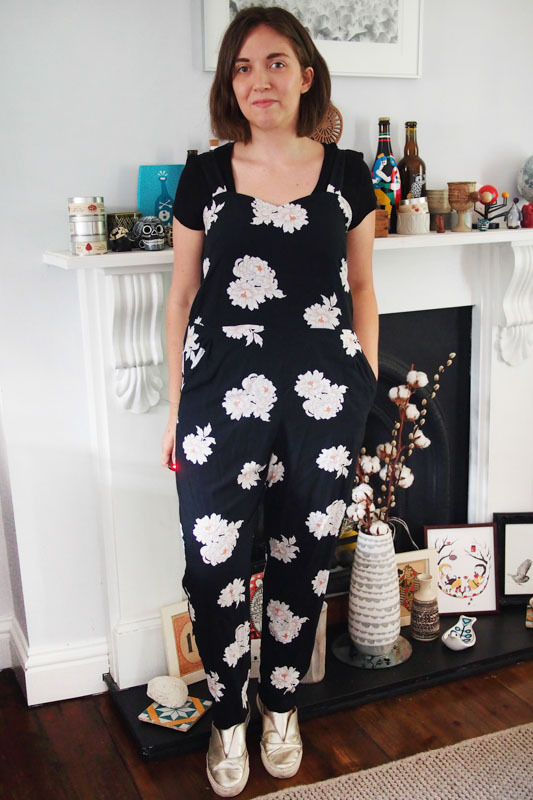 A gorgeous, classy and feminine jumpsuit! I think it looks much better without the elasticated waist – a good choice on your part. Enjoy wearing it. I think it looks great both ways, but it seems more “you” without the elastic. That fabric is beautiful too – I can see why you like it! Yup it was cute before but this is definitely more me! 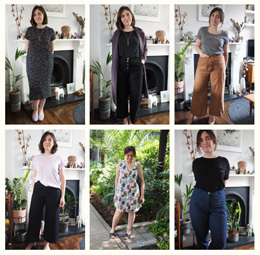 Hi Clare – yes I just omitted the waistband and sewed bodice to trouser, they fit together 1 to 1. But you’ll want to check you have enough room to move still from losing that inch or so of depth – my body is short so it was fine. Good luck! Very cute and better without the elastic (more comfortable too I should think). Tilly has just posted a link to that fabric which is still available, and a kimono would look great. Ah yeah that is a similar fabric, maybe I’ll do that! Love your fabric choice. You have such a defined style and the version without the elastic waistband is so you. I always admire bloggers that have really figured out what works for them. Its like you are truly expressing yourself through clothing. So cute i love it :) you look great! A great idea to omit the elastic at the waist. Maybe you could do that with the Bettine and have a more relaxed non-waisted dress there too? Love your take on the Marigold it looks great in the floral fabric. Definitely a summer hit here! Wow! Katie! 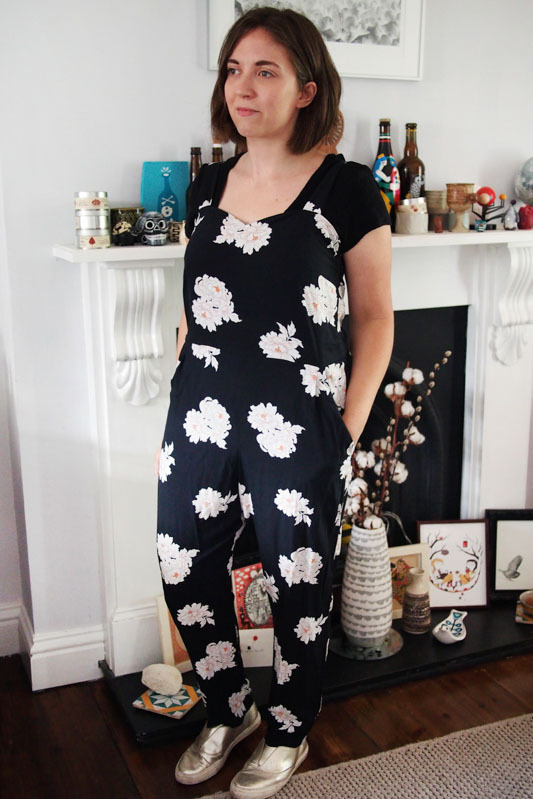 I’m not in the least bit a jumpsuit person but you have totally made me rethink. I love this on you so much. And that fabric is stunning! 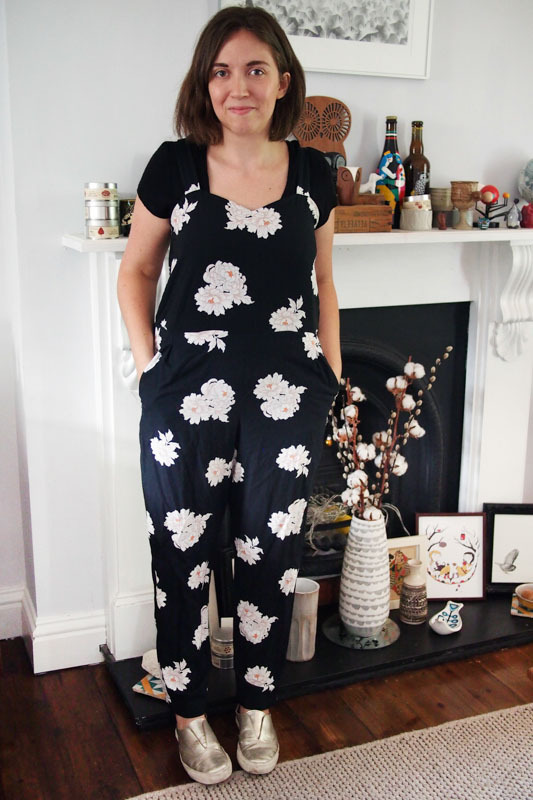 Great jumpsuit, and the fabric choice is perfect. It looks great! Very nice, my daughter keeps asking me to make her a jumpsuit so I think this will be the pattern I will use!